A burger and a hot dog One day had a nasty spat. The burger got insulted 'Cause the hot dog called him flat... So what happened after that? Well, you'll have to look inside this book to find out. Because, you see, there is a whole world out there in which burgers, hot dogs, sticky buns, ice-cream bars, bologna, popcorn, and all sorts of other food folks exist together A burger and a hot dog One day had a nasty spat. The burger got insulted 'Cause the hot dog called him flat... So what happened after that? Well, you'll have to look inside this book to find out. Because, you see, there is a whole world out there in which burgers, hot dogs, sticky buns, ice-cream bars, bologna, popcorn, and all sorts of other food folks exist together and do and go through all the daily stuff we all do. 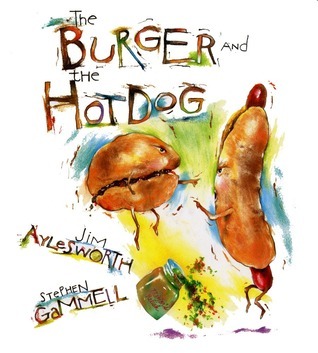 But it's only folks like Jim Aylesworth, together with artist Stephen Gammell, who can bring to us that world in a collection of hilarious rhymes and pictures. After all, what happens when a bunch of sugar cookies give a bagel a hard time, or an ice-cream bar gets stranded on a beach, or a couple of pickles go out dancing?...Well, come on in and see! And when you're done, try to invent some food folks of your own.